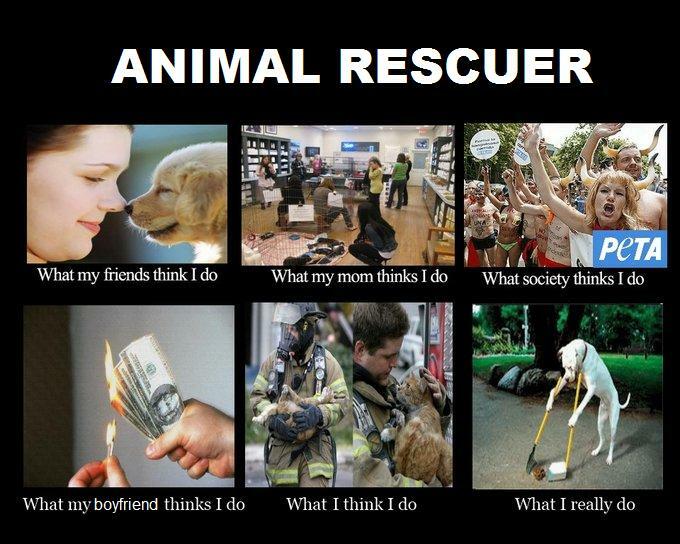 The truth is that most people don't know what rescuing really is. Or what it takes. (Or what it gives.) And most rescuers rarely talk about it. After all, most of us prefer animals over people. No, we were not born this way. Our "introversion" often stems from a belief, backed up by the evidence we see every single day, that most humans are hopelessly, irredeemably cruel—whether by ignorance or intent. Someone with their heart in the right place might find out that rescuing isn't as impossible as they thought, and might feel motivated to get involved. Someone with their heart in the right place and on their way to grab that homeless dog they saw just three minutes ago and take it home might realize just how irresponsible they're about to be. An irresponsible "rescue"—a rescue carried out by an inexperienced loner, without any support or guidance—does more harm than good. You might be taking a mom away from her newborn puppies (and sentencing those puppies to death). You might be interfering with a rescue effort already in motion (which will result in losing the dog forever). You might hurt, or even kill, the dog you're trying to help. You might hurt yourself. You might get someone else hurt. You might bring any number of dangers, including disease, into your home. My theme for this year's April Challenge, The A to Z of Dog Rescuing, isn't a tear-jerky plea for the welfare of animals. Rather, it's a guide—for that slice of the population that make the difference between most and all—on How To Rescue A Dog. The idea is to provide not just motivation but education. A successful rescue requires a whole lot of people, a whole lot of know-how, and a whole lot of luck. I can't help with the luck part, but—if you do decide rescuing is for you—I can be one of the people in your corner, and I can share what I've learned myself... which might help you have a better chance of making it a success. Rescue isn't pretty. More often than not, it gets worse before it gets better. Brief, practical guidelines. A blow-by-blow on the how-to. A glance at considerations (safety, medical, fostering). Videos from rescue organizations. Bloopers. Humor. Some seriousness, too. (But not too much.) The Dog Rescuer's Kit (for K) will give a list of items every dog rescuer needs to carry, for instance. E day will be all about the Easy Catches; on C day it'll be the nigh-impossible ones (Catch Me (If You Can)). Next weekend I'll be posting a Rescue FAQ as a sort of prep-intro and prequel to the A-to-Z posts. If you have any rescue- or dog-related questions, I'd love it if you shared them in the comments (or via email to guilie (dot) quietlaughter (at) gmail (dot) com) so I can include them in the FAQ and/or answer them during April. I realize animal rescue is not a popular subject. Many pet bloggers are more into breeding and dog shows than into tick-ridden, emaciated 10-year-old mutts abandoned tied to a tree somewhere. Most people, in fact, would simply rather not know (let alone do). And I'm hoping that some of those people, the ones who stand in the gap between most and all, might find their way to this blog. You might not be many, but you're the ones that make the greatest difference. This April's series is for you. Get a Kleenex for this one. Hi Guilie. It's great to see you again this year. I love dogs and you blog about them. So will come back agin and again this year too! All the best. I am all for rescue and all our normals are rescues. This will be educational and I will be looking forward to your. Posts. Birgit, I'm delighted to hear that! You're a kind, kind soul to provide homes for these abandoned ones, and I'm sure they make your life better (if a tad more complicated). I'll be looking forward to your visits, and your feedback! The have several shows on Animal Planet about rescuing pets. I've watched them and cried but the happy endings are so worth the tears. It's unbelievable the horror that goes on, and some of these folks are well meaning, but so over their head! And the punishment just sometimes doesn't meet the crime at all. This is a great idea and dare I say it. A great book idea! *Huge* fan of Animal Planet here... and yes, I watch with a box of Kleenex (and some I can't watch). Rescue is hard for many reasons, but one of the toughest is how society views (and judges) the decisions a rescuer makes. It's a really thin line sometimes, and learning to trust that the rescuer knows what s/he's doing takes time... and a bit of knowledge & experience, too. Found you on the A to Z challenge reveal link-up list, and your blog name caught my attention. I'm a volunteer puppy raiser for Guide Dogs for the Blind, and have always loved dogs. Looking forward to reading your posts--great idea for a theme! Good luck with your posts, I hope you manage to pass along advice to those who need it and can help. Wonderful topic - I look forward to reading very post. And I look forward to your visits :) Thank you so much! I'll be there alongside ya, taking notes! I've rescued my fair share of chickens, but could learn a thing or two about dog wrangling. You and all dog rescuers have my utmost admiration, Guilie! I would be a total emotional wreck and couldn't do it. To assuage that guilt, I make donations whenever possible. Looking forward to your posts! Rescue would be impossible without donations (and other non-active-rescue help) — so absolutely no need to feel guilty, Debbie. On the contrary; you and other donors, whether of time or money or any other resource, need to feel very, very proud... And very, very essential. Thank you Guilie for sharing. You/We the people ;should make a movie about the stray dogs in Curacao. Maybe we could rescue more ( and stop the import of expensive , out of their natural environment animals! )Looking forward to your posts! Thanks for finding the Dog Blog, Jacques. Much, much appreciated. I know this will have me in tears all April. Go for it, Guilie! Thanks for coming by, darling. Three cheers for #TeamDamyanti! Hi Gullie. I just lost one of my two beloved dogs in February (in truth, the more beloved of the two), and my husband and I are now in the process of trying to find the right rescue dog to adopt. Your A to Z posts will be invaluable. Thank you for your theme, and thank you for doing all the things you do to save lives. Oh, no... Susan, I'm so sorry to hear about your loss. But I'm (enormously) glad that s/he was so loved. And I'm super happy to be able to contribute, in whatever way I can, in helping you find a new hairy and four-pawed member of your family :) I'll very much look forward to your visits and your feedback. What you'll be doing in April will probably make some difference in perceptions and actions. It can't hurt. Hope your April posts are successful. Thank you so much, Lee! I'm beyond pleased to see your name in the comments here :) It'll be an interesting April for sure! This already had me in tears - of joy, Guilie! I see a book, really! Your posts are going to be such valuable information. I hear you on just picking up a puppy and making off home with it in the name of rescuing it - with no plan or forethought. I am looking forward to learning a lot from your posts. Thank you - so far, yours is my favorite theme! Hugs! And Yay! for being on the same team! Thanks so much! And glad to hear you are joining the A-to-Z after all — looking forward to reading! I can't think of a better topic. Especially educating people how to approach rescues. Just being able to recognize a stray versus a wandering pet. I live in the country and keep my dogs close to my home. However, I do see pets exploring close to the road. This is near and dear to my heart. Cheers. Thank you so much, Ann! Nothing beats finding a kindred spirit when it comes to animal welfare. I'll be looking forward to your visits — and to your own posts! Science is sorely needed in the world, today and always. What a fantastic topic (much more erudite than the crap you'll see at my place). I love my dog. A more loyal friend you'll never find. Plus, he can lick his crotch (see? see? This is the type of sophomoric nonsense you'll find at Penwasser Place). I'm a little confused. Who would be against the rescue of a dog or any animal when it needed help? it's true, not everyone is in a position to help. I can't have dogs where I live, I'm in an apartment, so it wouldn't work for me. But I applaud the efforts of anyone who can do so. I love your approach of trying to educate. That's the most important part. Also, not everyone is inherently mean. It's the exception rather than the rule. But we as a society only report something bad, not good. So the bad events stick out in our mind more. The fact that there are people getting involved in animal rescues proves that people are not all cruel. I'm so happy to see you here, Jeffrey! Thanks so much for taking the hop over, and for your faith in inherent goodness... It's a much-needed salve :) It's not so much that people might be against animal rescue, but rather that most prefer not to know... especially when, like you say, it feels impossible to help. I've been involved with rescue since I was 8, in Mexico, in the US, and now here in Curaçao, and the amount of cruelty I see, face-to-face, on a daily basis, has eroded my faith in humanity. In the vet practice where I volunteer, for instance, 8 out of every 10 dogs we see are neglected/mistreated. (And, due to the nature of the program, none of them are repeat visits, so these are all new cases... every week.) There is so much cruelty, whether—as I said in the post—by ignorance or intent. Still, "most is not all", and the people who make up that difference are the ones that make the greatest difference, not just for animals but for humanity as a whole. What a great theme! Our daughter is involved with diabetic cats in need, so I am learning about animal rescues and the dedication it takes. Thank you for being a caring person! I'm looking forward to read about the how to of rescuing - but then I'm afraid I'll end up starting one on my own here! We had an ad-hoc cat rescue centre back in the day when we had a big garden but now I'm not allowed to have in the apartment I'm renting so reading your posts might get dangerous with my inclination lol. But seriously, awesome topic! Looking forward to this, Guilie, though my only experience is with virtual dogs and cats. I'm afraid to even volunteer at a pet shelter for those in need might come home with me to a no-pet policy apartment, but I will learn much from you this coming month. I hear you, Beth... It's so easy to get attached, and even a big house and a big yard do reach—and surpass!—capacity :D Thanks so much for your interest, and I'll look forward to your feedback. A socially relevant, meaningful specialised topic, and hopefully the info/lessons will reach those who need them most. While I am not a dog person, I have friends and family who are involved with animals, and I know of some of the struggles they go through. Anything that raises awareness will be good, kudos to you for your choice! All the very best for the A-Z, Guillie! I am really looking forward to learning more. We took in a rescued boxer that had been burned by cigarettes - Jinx was so afraid of everyone but so loving. I cried when he got ill and we had to put him down. Thanks for coming by, Beverley, and for sharing the link to your A-to-Z blog! Off to take a peek now. Absolutely, Michele! Please share anything, long or short; I'll look forward to it! Nothing would make me happier than if these posts turned into a conversation, with all sorts of input and questions and points of view, and I'm beyond grateful that you, my sister-in-rescue, would like to contribute. Maybe you even want to do a guest post? I'd love that! Yay, Rhonda! Glad to hear it, and I'll be looking forward to your feedback :) Thanks so much for coming by! Looking forward to following you in A to Z. You rescue dogs. I rescue cats. But I think the hearts of all rescuers are the same, no matter who they're rescuing. What a lovely idea and great service you are offering. I'm an expat living in Ecuador which is rampant with street dogs. Many expats have become rescuers here without any of your knowledge. I'm going to post a link to your blog for my many "rescuer" friends. Thank you and good luck with the challenge. I hear you, Scarlett... I have a couple of friends who live in Ecuador (one in Cuenca, actually), and they say the same about the stray situation there. Here in Curaçao it's bad, but... well, it's a smaller place, fewer people, and education/awareness has a broader reach. Also, being a part of the Dutch Kingdom means many Europeans live here, and although Europe is by no means a haven for animals, the general outlook is that an animal living on the street is not ideal (in Latin America it's seen as a "normal", "nothing you can do about it" kind of thing). So I feel for your friends, and I totally understand the urge to help, to do something about it. It's precisely people like your friends to whom these posts are for, so I'm super grateful to you for sharing them. I hope they find them informative, that they help them save another life. It would be an honor. Sweet topic. I hope it educates everyone. We got our cat from the shelter. He's great. Moody, but great. I don't know much about dog rescuing so I'm looking forward to learning more. The point that got me was that by "rescuing" a homeless dog people may be depriving a litter of puppies of their Mom. That's so sad. I'm looking forward to knowing more. Great Post!Looking forward to your series and good luck during the #AtoZChallenge. Will check back for what will be quite a learning experience. As a dog lover, I am so excited about your theme. We live in the country and people drop dogs off all the time. I can't really have more than 4 dogs at a time so I have gotten really good at finding homes for them. Looking forward to your posts. What a great idea for your theme. It should be helpful, informative, and hopefully, it might even serve to convince some more people to join the fight to rescue dogs. Dog rescue seems to be a popular topic. Or may be you are a popular blogger. The number of comments indicate on of the two. Good luck. WONDERFUL! I'm glad you are using this opportunity to highlight rescue and I look forward to reading future posts throughout the challenge. Looking forward to your posts. One of my cats came from a rescue organisation and I have several friends who volunteer for the local rescue group so I know the love and heartache that can go into it.